Check your Huntingdon email frequently for schedule changes and updates, news from the College, and messages from your faculty/staff. Huntingdon email is the only email used for official college business. If you didn’t pick up your books and information resources yesterday and you’re on the book plan (books and information resources are covered by tuition and fees, rather than having to purchase them separately) you can pick up your books any day this week from 8:30 to 5:00 p.m. in the Scarlet and Grey Shop, Roland Student Center. It’s very important that you pick up this week. Unclaimed books will be returned to publishers soon. If you pay for the meal plan as a resident student and want to change your meal plan to the 10-meal or 19-meal plan (instead of the default 15-meal plan), you must do so by 4:00 p.m., Friday, January 18. See an email from Amanda McElwain that explains the meal plans and the procedure for changing from the default plan. If you haven’t registered your car for on-campus parking, you have until Friday, January 18, to do so. Campus security will begin handing out citations next week to cars without parking permits. Go to the Campus Security office in the Wilson Building to register your car. You’ll need to know the make, model, and license plate information, and you’ll need to have your driver’s license with you. If you plan to adjust your schedule, you must do so through SelfService by noon Friday, January 18. Remember that to be considered a full-time student, you must be registered for at least 12 credit hours. Dropping below full-time affects your financial aid, ability to play intercollegiate sports, and ability to live in campus housing, as well as your progress toward graduation. Need a new ID card, Commuter Meal Plan, or additional Flex Points? See this page on the website: https://www.huntingdon.edu/admission-aid/student-financial-services/miscellaneous-purchases/. If you have an anticipated credit on your account balance and would like to charge the item you wish to purchase to your account, see an email from Amanda McElwain to explain the procedure, which you may accomplish through the helpdesk system. Here’s the Buzz: Time to Celebrate! The Huntingdon College family will celebrate the coaching legacy of Buzz Phillips, athletic director emeritus and former head women’s basketball coach who retired as the season began this year, Saturday, January 19. Basketball alumni/ae should gather at 11:30 a.m. in Roland Arena for check-in. A brief program will follow at noon in the lobby of Roland Student Center, followed by a meet-and-greet with current and former players. Between the men’s game at 2:00 and the women’s game at approximately 4:00 we’ll celebrate the accomplishments and service of Coach Phillips. Attendance is free and everyone is welcome. Come and add your well-wishes! Huntingdon has partnered with Rise Against Hunger, an international hunger relief organization that distributes food and life-changing aid to the world’s most vulnerable populations, to present a campus-wide service project for Martin Luther King Jr. Day of Service, Monday, January 21, in Roland Arena. To find out more and to sign up, contact DaMonta’ Wiggins in the Hut. The annual Black History Month art exhibit will feature the work of Huntsville artist Willette Battle. The exhibit will open Thursday, February 21, 2019, at 7:00 p.m. in Seay Twins Art Gallery on campus, and will run through February 27, with the show open for viewing from 6:00 to 9:00 each evening. Known for her vibrant color palette and freeing sense of play, Ms. Battle’s paintings and sculptures depict themes of community, Afrocentrism, and inner strength. Ms. Battle earned her Bachelor of Arts in studio art and Bachelor of Science in computer science from Albany State University (Ga.) and her Master of Fine Arts in painting with an electronic studio emphasis at Howard University (Washington, D.C.). Is one of your New Year’s Resolutions to support Huntingdon financially? We hope so! To make it easier, the Office of College and Alumni Relations is pleased to announce a recurring giving program to allow donors who work for employers other than Huntingdon to make automated monthly deductions from checking or savings accounts. Monthly deductions allow investors in the College to spread giving over a 12-month period. If you are interested in showing your support for Huntingdon monthly without having to think about it, please consider establishing a monthly gift to Huntingdon by completing the ACH Debit Authorization Form on the Huntingdon website at https://www.huntingdon.edu/alumni-friends/giving-to-huntingdon/ach-transaction-form/. For those who work at Huntingdon, monthly payroll deductions can be arranged through the business office. Big CCV Event Coming in February—and lots more! Huntingdon’s Center for Career and Vocation has partnered with J.C. Penney-Eastdale Mall to offer the JCPenney Suit-Up Event, Sunday, February 17, 3:00 to 6:00 p.m. The event will provide exclusive discounts on career wear for students, faculty/staff volunteers, and first-year alumni. The store will be closed to the public during the Suit-Up Event. This event will be held at the Eastdale Mall store. Watch for more news from the CCV. The athletic department is looking for students interested in public address announcing for athletic events in the spring: Baseball, Softball, and Men’s & Women’s Lacrosse. The positions are paid and require working nights/weekends. Contact Eric Levanda at elevanda@hawks.huntingdon.edu if interested. You get to hear yourself talk and watch the Hawks at the same time! Can’t beat it. Students who are approaching degree completion (90 or more completed hours) should complete a Graduation Application as soon as possible. Doing so prompts a record review and progress completion report to ensure you have considered every class possible. Graduation applications may be found on the Registrar’s Office website. Be sure you complete the one that pertains to your program (traditional day or Evening Studies). The 2019 issue of Huntingdon College Magazine was mailed during the holidays. Did you get yours? If not, stop by the Office of Communications, Flowers 103, to pick up your copy. We welcome Alvin Richardson as site coordinator for the Evening Bachelor’s Degree program at Huntingdon. He moves to the home campus from the Birmingham-Lawson State CC site, which has closed. The SaveFirst program has moved their former Huntingdon location to the Morgan Library in downtown Montgomery. Thank you to all who served as angels for children in need in the community this year. Huntingdon College faculty and staff helped 50 children have a better Christmas in 2018! UPDATE: The Hawks earned their 7th victory of the season Jan. 13, setting a new record for wins in a season; next match Sat., Jan. 19, at Florida A&M. B.J. Barker ’22 was named USA South Men’s Basketball Rookie of the Week December 31 for his performance in three games during the week prior. He averaged 13.7 points, 2.3 rebounds, one assist, one steal, and made 8-of-11 free throws in three games. Tyler Blackwell ’14 married Laiken Free, December 15, 2018. Lyndi Bradley ’15 has earned her Master of Social Work degree with a concentration in social leadership and a certificate in Leadership in Executive and Administrative Development. She works as a researcher and project coordinator for the Institute for Family Violence Studies at the Florida State University College of Social Work. We wish the Rev. Dr. John Brannon ’85 a long and happy retirement. Dr. Brannon has served as pastor of First UMC of Atmore, Ala., and as a much-loved instructor in the College’s Evening Studies program for many years. We thank him for his loyalty to the College and for his service! Tyr Brenner ’94 works as a senior contract negotiator for Lockheed Martin and lives in Merritt Island, Fla. He has earned his MBA, CPCM, PMP, and DAWIA III (Contracting, Master of Military Art and Science, and Master of Strategic Leadership). Destree Brown ’09 married Raymond McNeil, December 28, 2018. Dr. Lisa Clark, former assistant professor in the Department of Sport Science and Physical Education, has taken a position with Alabama State University. 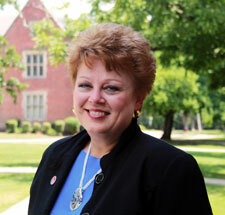 She has taught for Huntingdon for 7 years—a loved and respected member of the faculty. We wish her well. Karyn Causey ’17 married Dylan Peterson, December 28, 2018. Rev. Jenny Wren Miller Clanton ’06 serves as the senior minister at the United Methodist Church of North Alabama and lives in Huntsville, Ala.
Chad Cotant ’12 completed his J.D. at Jones School of Law. Chad married Lauren Hobbs, who works as assistant dean of student affairs at the University of Alabama and formerly served on the Huntingdon student life staff, December 8, 2018. We wish a long and happy retirement to Dr. Renee Culverhouse, who has served our W. James Samford Jr. School of Business and Professional Studies as dean for several years. She also directed the Evening Studies and Evening Bachelor’s Degree programs. Dr. Culverhouse retired at the close of the fall semester. Blake Denton, formerly the Methodist Archives Center assistant, recently accepted a position with the Alabama Bicentennial Commission. The Alabama Bicentennial Commission was established by the state legislature to assist with and facilitate statewide and local bicentennial celebrations and commemorative events through 2019. Blake serves as the communications/marketing assistant, in which some of his duties include writing monthly newsletters and planning/coordinating different events and exhibitions throughout Alabama. Additionally, his review of “Alston Fitts’ Selma: A Bicentennial History” appears in January’s issue of the Alabama Review. T.I. Duncan ’19 broke the record for career assists, gathering 4 in the team’s win over Birmingham-Southern, December 17, to reach 245. The previous record, held by Tiffany Jordan ’09, was 242. She was also name USA South Women’s Basketball Player of the Week December 17 for her performance in two games during the week prior, when she averaged 20 points, 12 rebounds, 6.5 assists, and 2 blocks in the 2 games. Danny Gissendanner ’80 has retired from the U.S. Army as a Chief Warrant Officer (CW4) with specialties in data processing and logistics. He serves as enterprise mobility administrator for Ovation Wireless Management, assigned to Vulcan Materials Company. He lives in Calera, Ala.
Brandie Moultry Glover ’11 works as a sales service distribution associate for the U.S. Postal Service and lives in Ozark, Ala.
Carey Head ’94 is the founder, owner, and director of Comedy Arts Theater of Charlotte, which will celebrate its grand opening in February 2019. He also serves on the board of directors for the Little Theater of Gastonia (N.C.) and is a squadron deputy commander in the North Carolina wing of the USAF Auxiliary, Civil Air Patrol. Dr. Kent Hagan ’11 has been selected as the sports medicine fellow at the University of Pennsylvania for the 2019–2020 academic year, while Caitlin McMahon Hagan ’12 has completed her MBA at Thomas Jefferson University and has accepted a position as manager of the graduate business programs at TJU. Trey Hayes ’19 was named to the American Football Coaches Association’s Division III All-America second team in December. He is the sixth Hawk to earn postseason All-America or All-American status, but only the second to score recognition from AFCA. Former Huntingdon defensive lineman D.J. Chappell (Dennis Barnett ’15) was the first AFCA All-America selection in 2012. Trey (linebacker), Chase Young ’19 (kicker) and Chris Herring ’19 (offensive guard) were also named to All-Region teams. Cullen Milner ’14 married Sofia Castello, December 15, 2018. Jeremy Murphy ’16 married Kyndall Moorman-Key, December 22, 2018. Hunter Smith ’14 has passed all sections of the CPA exam, and we congratulate him! He is an accountant with Warren Averett. Wes Smith ’19 married Kennedy Quick, December 31, 2018. Jeremiah Stone ’06, pastor of student ministries for Vestavia Hills UMC, has announced his engagement to Allison Putman. Mary Hardin Mitchell Thornton ’91 was honored with the Fricks Award for lifetime service to downtown from the Downtown Development Authority of Rome, Georgia, in December. Mary Hardin’s father served as chairman of the city commission. Mary Hardin served as head of the Keep Rome Floyd Beautiful for a decade before joining the team at Adams Management in the summer of 2018. Jennifer Hart VanDeWoestyne ’97 serves as director of academic advising for Queens University of Charlotte and lives in Fort Mill, S.C.
Betty Finlay Brislin ’49 passed away December 29, 2018, in Montgomery. Betty was a recipient of the Huntingdon College Loyalty Award and a former member of the Huntingdon Alumni Board. She had a long career in state government and spent her retirement actively volunteering at First United Methodist Church in Montgomery and at the Montgomery Zoo. She would often visit the alumni office selling home-baked goods to benefit the zoo and she always had a gift for Huntingdon with her. Rev. Glenn Butler, senior minister at Gulf Shores United Methodist Church, died December 27, 2018. Rev. Butler was the father of Ethan Butler ’04 and Emma Butler ’07. Dan Cotant, father of Adam Cotant ’09 and Chad Cotant ’12, died January 6 in Dothan. We extend our condolences to Adam and his wife, Brittany Gaydosh Cotant ’08, and Chad and his wife, Lauren Hobbs Cotant, a former member of the Huntingdon student life staff. Betty Bennett Janney ’49 died December 6, 2018, in Montgomery. As a student, she served as editor of The Prelude, was a member of Chi Delta Phi national literary fraternity, and served as vice president for Theta Eta sorority. She served as organist for Capitol Heights UMC for a number of years. Frances Hastings Moore ’46 died January 6 in Birmingham, Alabama. Frances was a former member of the Board of Trustees, the National Alumni Board, and one of the few alumni in the history of the College to receive both the Alumni Achievement Award and the Alumni Loyalty Award. She was a member of the Huntingdon Hall of Honor and of the John Massey Heritage Society. Her family designated Huntingdon as the recipient of gifts in her memory, for which we are grateful. We extend our condolences to her daughter, Louisa Moore Elmore ’84, and family. Nancy Mason Rice ’50 died Christmas Day in Phenix City. We extend condolences to her family, including her son, Bill Rice ’74, and his wife, Ansley Callaway Rice ’75; and her grandson, Will Rice ’03, and his wife, Katharine Dozier Rice ’05. Rev. Malcolm Yaple of Chesapeake, Virginia, died November 14, 2018. Rev. Yaple was the husband of Ruth Barnes Yaple ’51. Together, the Yaples established the Daniel and Shellie Barnes Endowed Scholarship in memory of Ruth’s parents. After Ruth’s death, Rev. Yaple established the Ruth Barnes Yaple Endowed Scholarship in her memory. He was a member of the Order of the Countess of Huntingdon, the Huntingdon Hall of Honor, the John Massey Heritage Society, and the Huntingdon Society.